Designated in January of 2001, Mount Blanchet Park protects valuable wildlife habitat including spring range for ungulates on the south-facing slopes along the northwest arm of Takla Lake. Significant caribou over-wintering and calving areas, and alpine habitat suitable to mountain goat and grizzly bear. Sockeye salmon frequent several of the creeks. Approved Purpose Statement and Zoning Plan [PDF 2.43MB] for Mount Blanchet Provincial Park is available online in pdf format. 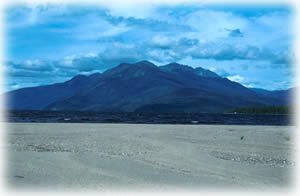 There are no developed trails in this park however, there is a rough trail from the shore of Takla Lake to Mt. Blanchet. For your own safety and the preservation of the park, obey posted signs and keep to designated trails. Shortcutting trails destroys plant life and soil structure. Extensive alpine provides valuable habitat for local caribou, mountain goat and grizzly bear. Although difficult to access, this park provides a good wildlife viewing opportunities.